A Combat Engineer Vehicle is specialist vehicle used to clear or create tank obstacles. They are normally built on the chassis/hull of that nations Main Battle Tank so that they can keep up with the to complete these duties. They also remain or are deployed after a conflict for engineers to carry our repairs to military installations. Poland during its years as a member of WARSAW, licensed manufactured the Russian T-72 Main Battle Tank. It then went on to up grade these vehicles and also export them under the designation PT-91. This set a requirement for an Combat Engineer Vehicle for both these vehicles to be manufactured by Poland. MID stands for Maszyna Inżynieryjno-Drogowa, which is Polish for Engineering-Roading Machine. Bizon is Polish for Bison. The Polish MID Bizon CEV is based on the PT-91 tank hull. Development started in 1988. 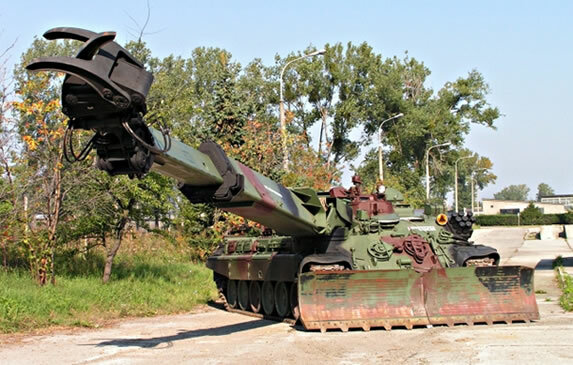 The first produced vehicle was completed in 2000, with full production for the Polish Army completed in 2005.
manipulator arm (the maximum amount of arm 7.75m, 7.94m maximum length, minimum length 5.94m, the working angle Horizontal: 240 degrees, vertically, from – 55 to + 60 degrees, the pan 240 degrees / 7 seconds .) It is possible to control the boom of the portable desktop. Equipment is removable boom: bucket capacity koparkowa 0.96 cubic meters. and a width of 0.92 m, the gripper jaw with maximum openings of 1 m and a capacity of 3 tons and a ripper tooth with a length of 0.45 meters.